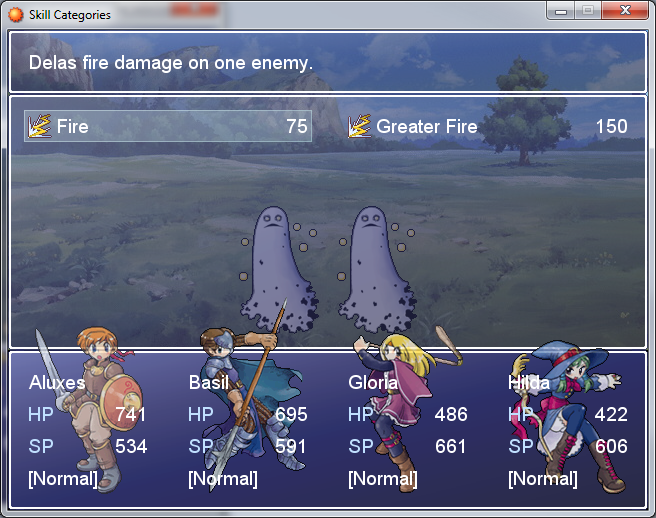 Adds Skill Categories to the Default Battle System. For every Skill Category your actor gets a new command, assuming they know skills from that category. Actors also get their default "Skill" command. Place this below all of Blizzard's scripts. It should have compatibility with all of his stuff. # your actor gets a new command, assuming they know skills from that category. # Actors also get their default "Skill" command. # Name it whatever, and make sure to give it an unused element id. # to be considered in that category. # -Not tested with anything other than the default battle system. # But this script would be useless if you were to use it. # conventions that are required. # the topic and I'll try to look at it. # -Works with Unique Skill Commands by Blizzard. Configuration is in the script. Be sure to read the compatibility section too. 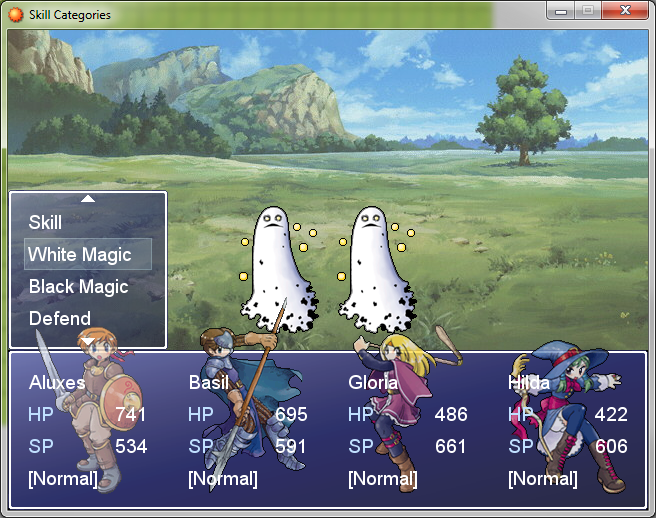 Not tested with anything other than the default battle system. Will not work with Skill Separation add-on from Tons of Add-ons by Blizzard But this script would be useless if you were to use it. Will not work properly with Battle Icons by Juan, however, other scripts that add similar functionality should work depending on the naming conventions that are required. Works perfectly with Easy Overdrive System by Blizzard. Place this script below his. If you run into any other scripts that don't work with it, just post it in the topic and I'll try to look at it. Works with Unique Skill Commands by Blizzard. Works with Chaos Rage Limit System by Blizzard, place this script below it. I can't thank you enough for this script. Thanks a ton man! You sir just won my respect. Thanks a lot for this! EDIT: I've found an incompatibility issue but i am not sure what causes it. The problem happens in battle; the word "Item" appears just in the Item command for actor in position 1 (despite wich character that is). The command itself appears for ALL actors, but the word "Item", just for the first one. The result is a blank square option for any actor who is not in position number 1. I am a god in BETA status and therefore, i may contain bugs and such. It might have to do with the Chaos Rage System or the Soul Force Combo System. Maybe the Threat System or the Weapon Unleash Skills, regardless, I'll look into it after I'm done helping Aegisrox. EDIT: In the meantime, try editing the placement of the script. Place it below every other script but above main. EDIT: I think I've pinpointed it to Chaos Rage Limit System. I just tried it and my Item and Defend slots seem to disappear. I'll work on a new update. Thanks for posting the compatibility bug. Had some time after work and I was able to fix it. Just make sure this script gets placed below Chaos Rage Limit System. Tested and confirmed; it works as intended. Awesome job here, gameus!